Azzi, Stephen and D. Kwavnick. "Minority Government". The Canadian Encyclopedia, 13 December 2017, Historica Canada. https://www.thecanadianencyclopedia.ca/en/article/minority-government. Accessed 18 April 2019. 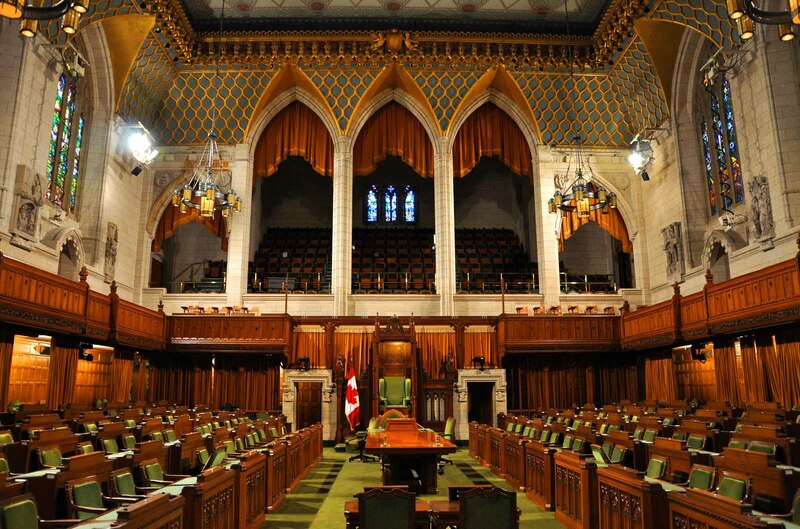 A minority government exists when the governing party does not hold a majority of seats in the House of Commons (or provincial legislature) but is still able to command the confidence of the House. A minority government exists when the governing party does not hold a majority of seats in the House of Commons (or provincial legislature) but is still able to command the confidence of the House. Minority governments also exist at the provincial level and in Yukon, but not in Northwest Territories or Nunavut, which do not have political parties and are governed by consensus governments. The party that wins the most seats in a general election is usually invited to form government. If the party wins half or less than half of the seats in the House of Commons but has a plurality (the most seats), then its leader becomes prime minister and he or she appoints Cabinet ministers. Because seats are distributed more evenly among the parties in minority Parliaments, opposition parties have greater opportunity to block legislation from passing. A minority government must therefore negotiate with other parties and adjust its policies in order to garner the majority of votes required to pass legislation. When a victorious party fails to elect Members of Parliament (MP) in certain regions, a prime minister may resort to the Senate to fill out the Cabinet. Likewise, an unelected person can be appointed as a minister; no law requires that a Cabinet member be a sitting MP or senator. A minority Parliament need not result in a minority government if two or more parties are willing to form a coalition government, in which Cabinet positions are shared among two or more parties. However, since 1867 no peacetime coalition governments and only one wartime coalition (1917–21) have existed. However, in order to govern co-operatively, parties will often create informal alliances in minority Parliaments. A minority government must maintain the confidence of the House in order to continue to govern. 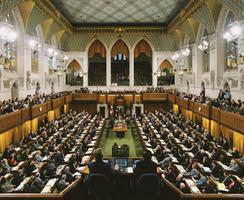 According to House of Commons procedure, “the Prime Minister and the Cabinet are able to exercise authority only with the consent and approval (‘confidence’) of a majority of the Members of the House of Commons.” In a minority Parliament, the party that forms government does not hold the majority of votes required to completely ensure its approval. It must therefore earn its approval from members of other parties and independents. Not all votes in minority Parliaments amount to confidence. However, votes that do carry the weight of confidence include those related to the Speech from the Throne, money bills (budgets) and specific confidence votes. If government loses the confidence of the House, the prime minister will typically request that the Governor General dissolve Parliament and call an election; otherwise, the prime minister must resign at this point. Alternatively, Parliament will remain in session and a new party or coalition will form government, bypassing an election. There have been 12 minority governments in Canada since the first was elected in 1921. Of the six Conservative minority governments, only two have endured for more than a few months (2006–08 and 2008–2011) and only two (1957–58 and 2006–08) did not fall on confidence votes. Of the six Liberal minority governments, two were defeated in the House (1972–74 and 2004–06) and three were able to govern with the support of the third parties until they could call elections at a time of their choosing (1921–25, 1963–65 and 1965–68). One government under William Lyon Mackenzie King (1925–26), left office following the Governor General’s refusal to dissolve Parliament and call an election (see King-Byng Affair). The balance of power in minority parliaments has been held by reformist parties of the broad left (Progressive Party, Co-operative Commonwealth Federation, New Democratic Party) or, occasionally, by a regional French Canadian party (Créditistes) — parties that have distrusted the intentions of the Conservative Party, which was, in any event, unable to compromise its policy positions to accommodate them. The Liberal Party, however, has always been willing to accommodate them, at least minimally. For example, the King government's ability to retain the confidence of the House from 1921 to 1925 depended partly on the strong anti-tariff policy favoured by the Progressive Party. As well, the Lester B. Pearson minority governments of 1963–65 and 1965–68 won over the NDP with legislation that included a considerable expansion of social programs. The Pierre Trudeau minority government of 1972–74 wooed the NDP by enacting, or by committing itself to enact, regulation of election expenses and the establishment of Petro-Canada and the Foreign Investment Review Agency. The minority government of Paul Martin (2004–06) clung to power with the support of the NDP, in part by amending its proposed budget to increase spending on social programs and defer tax cuts for large corporations. However, Martin’s government ultimately lost the NDP’s confidence. In contrast, immediately following the election of the Conservative minority government of 1979–80, Prime Minister Joe Clark announced that he would govern as if he had a majority. Allied with the Liberals and NDP, he tried to deprive Social Credit, who held six seats, of its standing as a recognized political party in the House of Commons. As a result, Social Credit’s right to speak in all matters before the House was sharply reduced as well as its right to public funding for its caucus research office. In the confidence vote of December 1979, Social Credit withheld its support for the government despite its chances of re-election being slim. None of the provinces (or Yukon) has had as many minority governments as the federal government. In fact, Alberta is the only province to have never elected a minority government. Northwest Territories and Nunavut do not have political parties and are instead governed by consensus governments. While a minority government’s power in the legislature is restricted on the whole, its influence is also restricted in legislative (and Commons) committees, which have significant power to draft and amend legislation. In minority situations, opposition members outnumber government members on committees and can therefore use committees for their purposes. Though politicians frequently claim that their parties need a majority in order to carry out their program, this has seldom been true. Though never holding a majority, the Lester B. Pearson governments were among the most productive in Canadian history, enacting universal health care, the Canada Pension Plan, the Canada Assistance Plan, and the Canada Student Loans Plan, as well as unifying the armed forces and creating a new national flag.